Vinyl – Sugar Sady Babydoll Dress. TRUTH Kaijah @ Truth Hair VIP Group. Vinyl – Sugar Sady Boyshorts. FOXCITY. Photo Booth – New Beginnings (w/white exterior) @ Soiree. Foxwood – Fleur – Curtains – Blue @ Collabor88. Foxwood – Fleur backdrop @ Collabor88. FOXCITY. Drift Fatpack exclusive @ Soiree. Real power is control. Knowing that you can do anything…and not doing it only because you can. Attitude is an Artform – Winter’s Malice Circlet @ We ❤ RP. –Endless Pain Tattoos– Eisblume @ We ❤ RP. – shanghai – Libeli Tiara Silver. Silvan Moon Design – Selenia of Galacia Gown Set @ We ❤ RP. Silvan Moon Design – Selenia of Galatia Gown-Icy Pearls Add-On @ We ❤ RP. YS&YS – Immortal skin applier. Author AleriahPosted on December 31, 2018 December 31, 2018 Categories Fantasy, Fashion, Hairstyles, SkinsTags A&A, Attitude is an Artform, Cole's Corner, Endless Pain Tattoo, Runaway, Second Life, Secondlife, Shanghai, SIlvan Moon Design, SL, Virtual Fashion, Virtual Girls, We love Roleplay, YS&YSLeave a comment on Real power is control. Knowing that you can do anything…and not doing it only because you can. I am normally not into this genre of items, but I knew exactly what I wanted to do with this set, when I saw it! It was just too awesome to let pass me by! 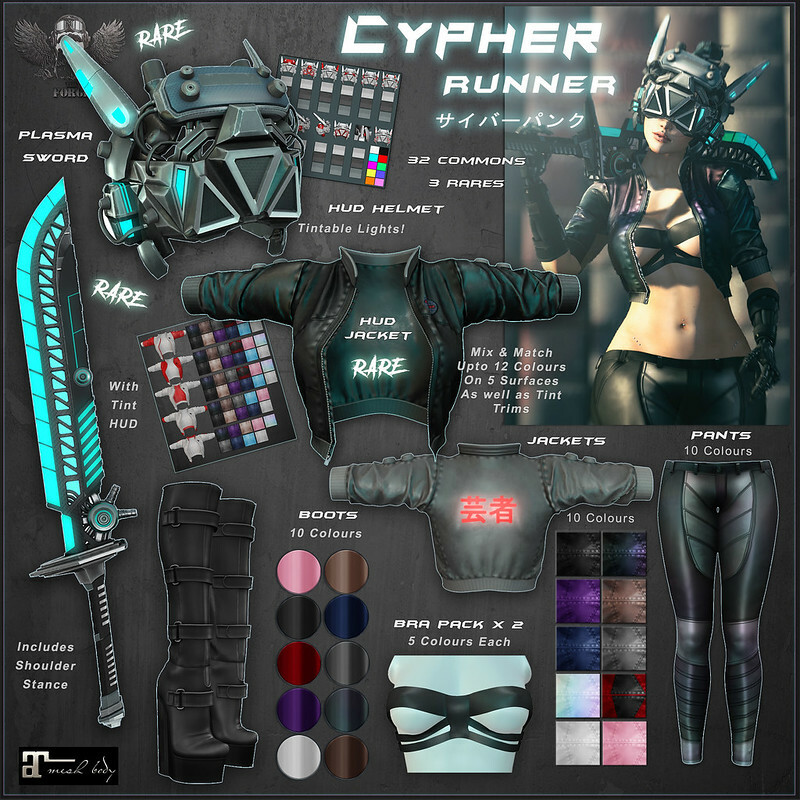 New [The Forge] Cypher Runner @ Lootbox. [The Forge] Cypher Helmet, Rare. [The Forge] Cypher Sword, Rare. Hair: A&Y – Cyro Hair (Female) @ mainstore. Bike: [Neurolab Inc.] Z-Tronic (Black) @ mainstore. Skin: YS&YS – Drew skin applier (Tone 02) @ mainstore. Foxcity. – Rider Bento Pose Set@ mainstore. Foxcity. – Photo Booth – The Workshop @ mainstore.